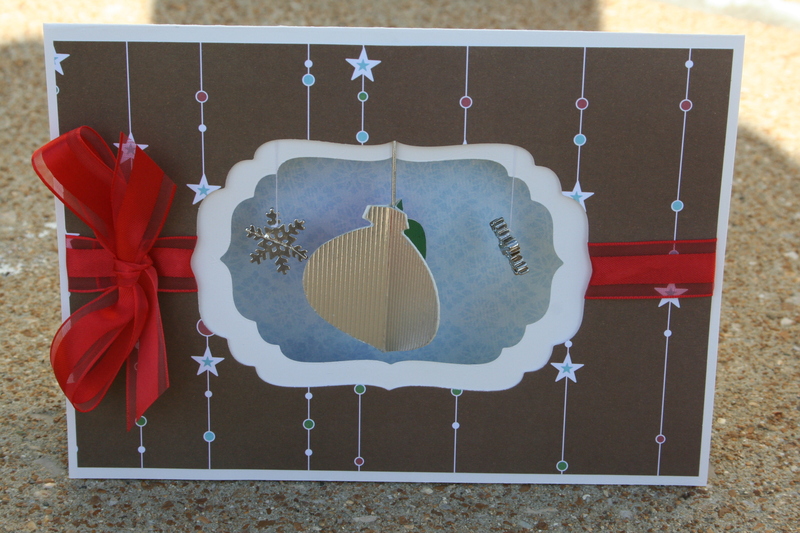 Waltzing Mouse is hosting a competition for World Card Making Day (last Saturday) that ends on 10/9/10. I am getting this in under the wire! She has been sitting on my desk colored for days, I just hadn’t figured out what to do with her. I’m not particularly happy with the way it turned out because I had to rush to finish it before I went out of town. Also, I wanted to color her with my Copics but my printer ink must not be compatible with alcohol based markers because it kept running! I used watercolor pencils and a water pen instead. For the fur, Distress Picket Fence Stickles came in handy to give it some depth. 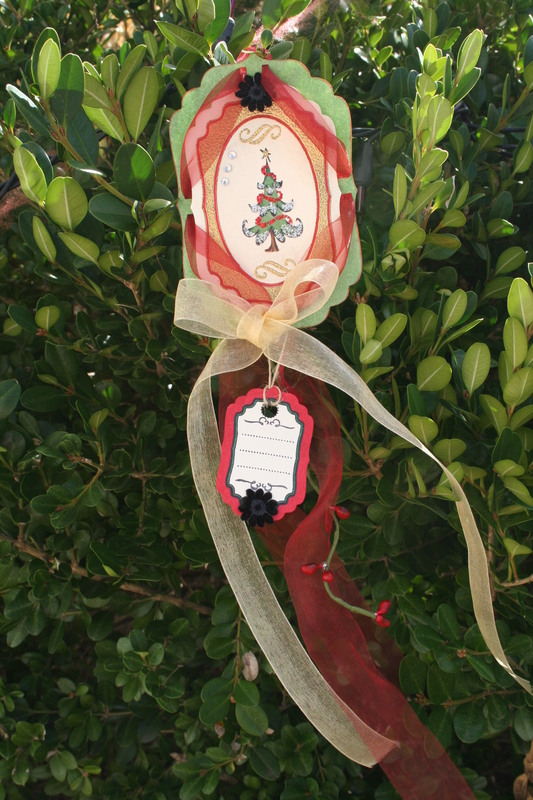 I also used Xmas Red Stickles of the bow on the present. I wanted to make it gold but didn’t have anything that fit the bill. 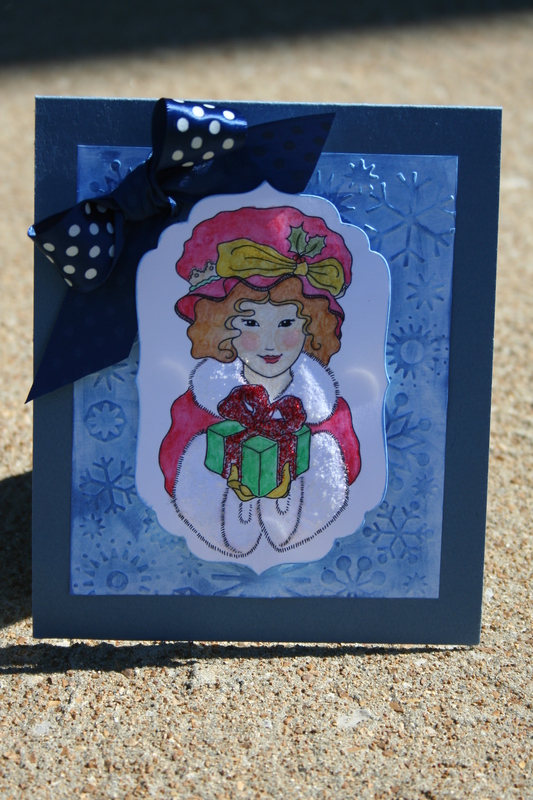 Using Nesties, I cut her out and popped her up on some DCWV patterned paper (Holiday Collection) that I ran through the Cuttlebug with the snow folder. 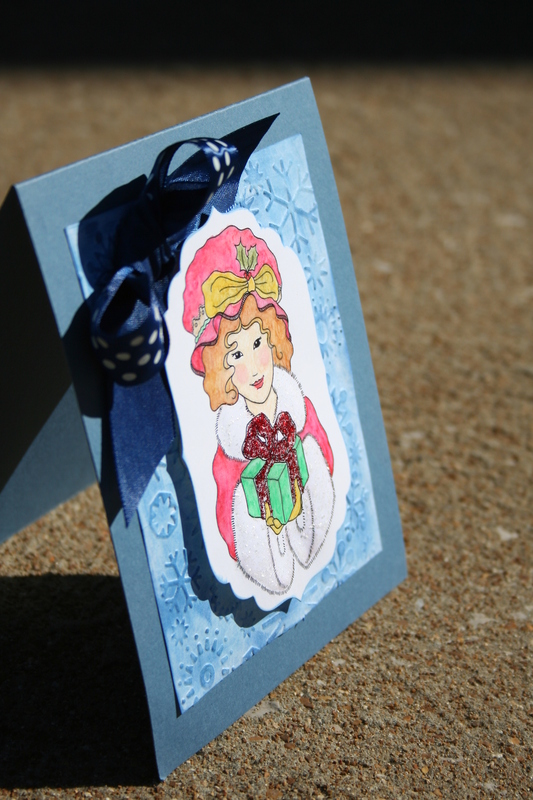 I inked around the edges of Harriet with Brocade Blue Stampin Up ink. 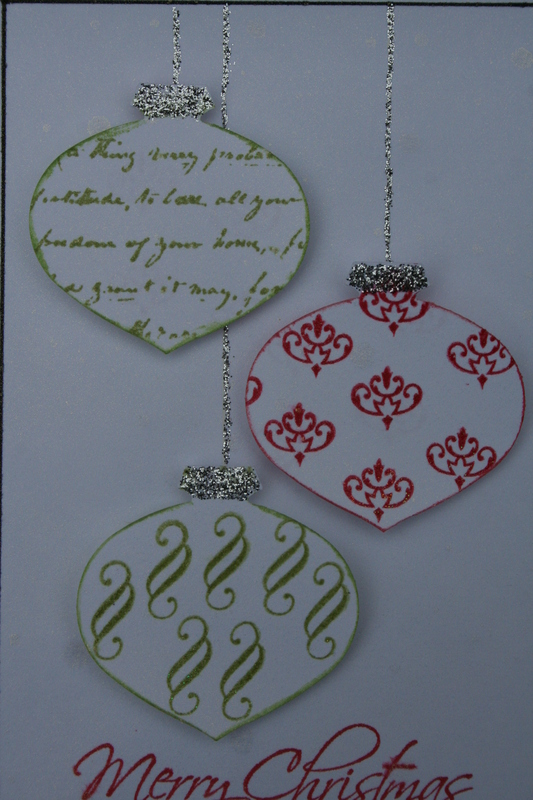 I also inked the Cuttlebugged paper, edges and embossed image. Finally, I added the bow. I am going to have to use her again and do her justice! 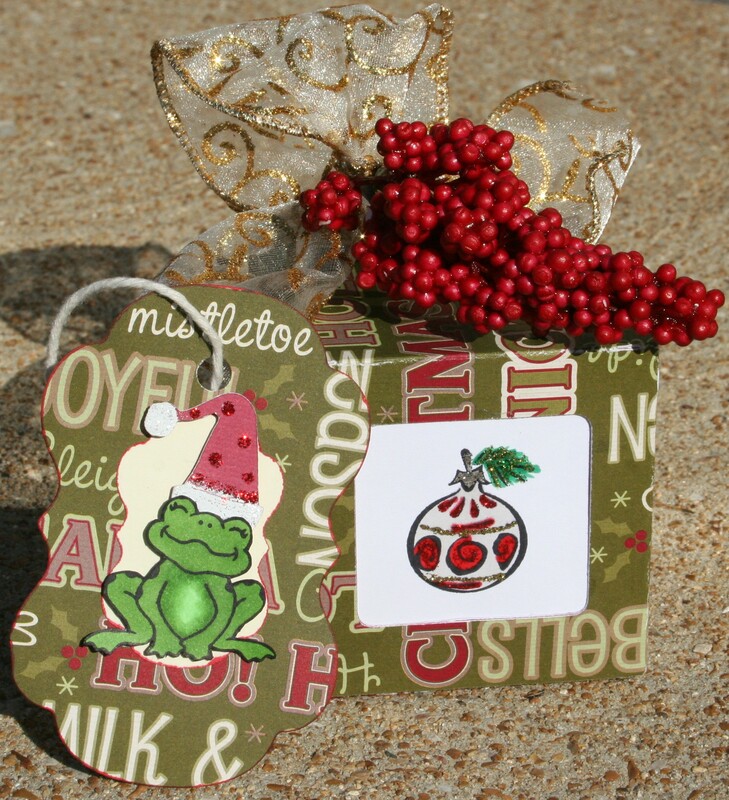 I recently received an order from Stampin Up. One of my items was an Ornament punch. When I saw this weeks challenge at Polka Doodles I knew exactly what I wanted to do! 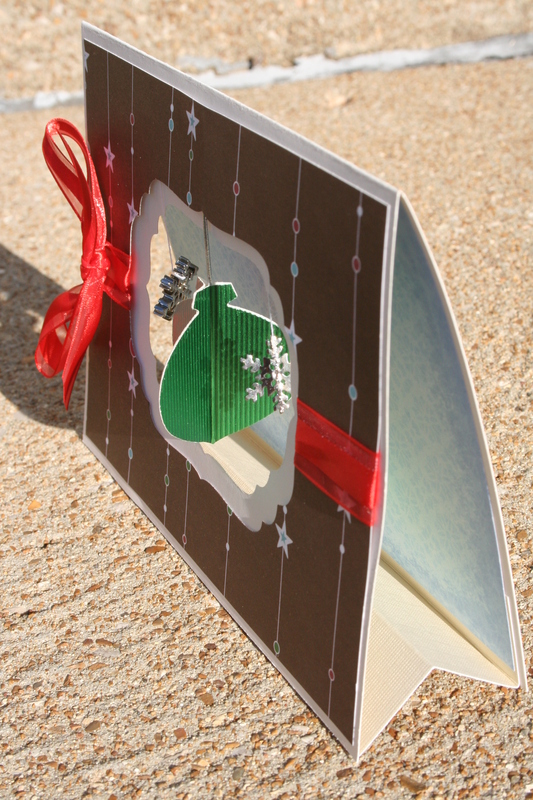 So the challenge this week was to make a card using a “fancy or interesting fold.” Now, to be honest, I don’t think the fold I chose is all that interesting, but it qualifies. 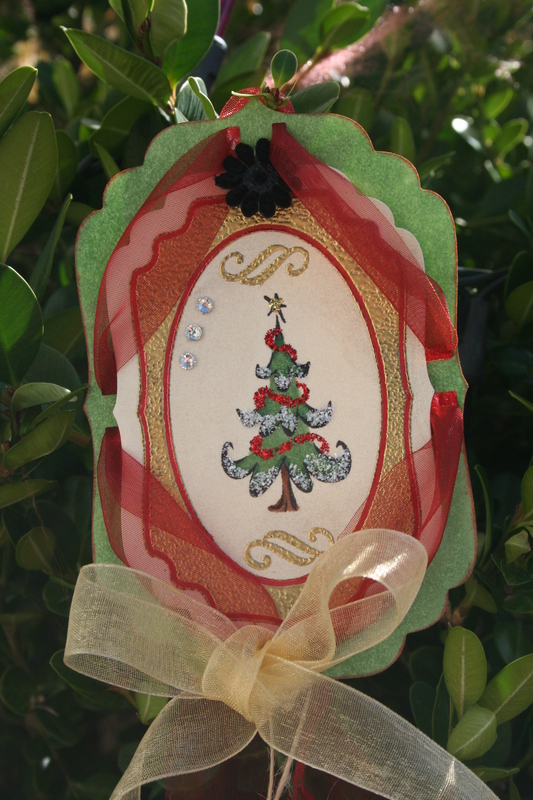 I actually think what I decided to do with dangling ornament is more fun! Thanks for looking, and your kind comments! 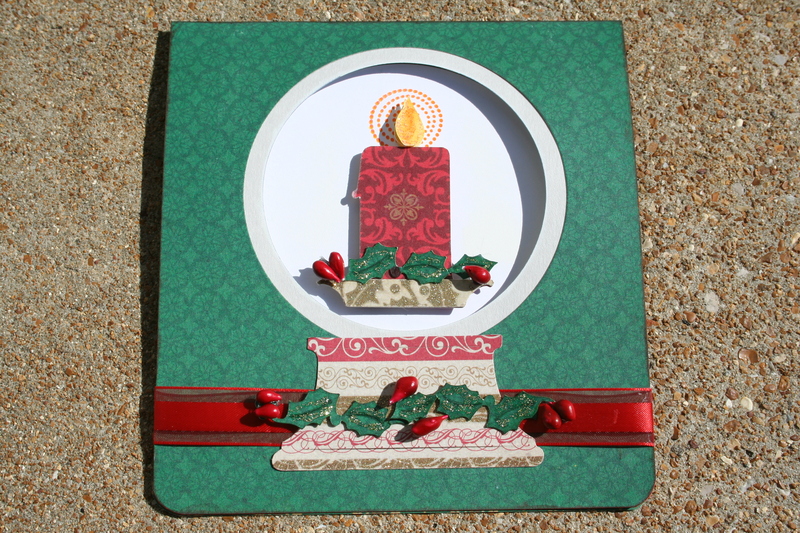 This week at BBTB2 they challenged everybody to make something using a candle cut from a Cricut Halloween Cartridge. I don’t have the cart, but I found a candle in the Joys of the Season cart and decided to use it. I had so much fun making this card! 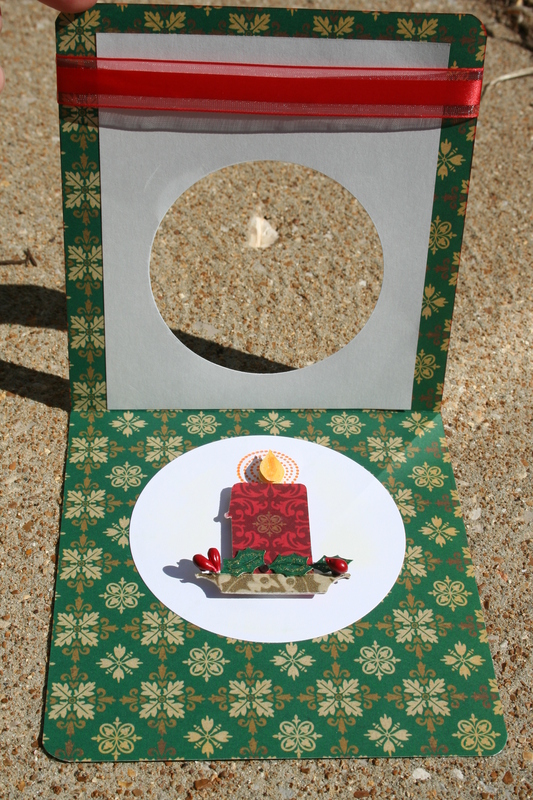 I wanted to make a snow globe with a candle in it, but I wanted the ball to be open to the inside. I used my circular Nesties for this because I find it easier to line everything up than with the Cricut. 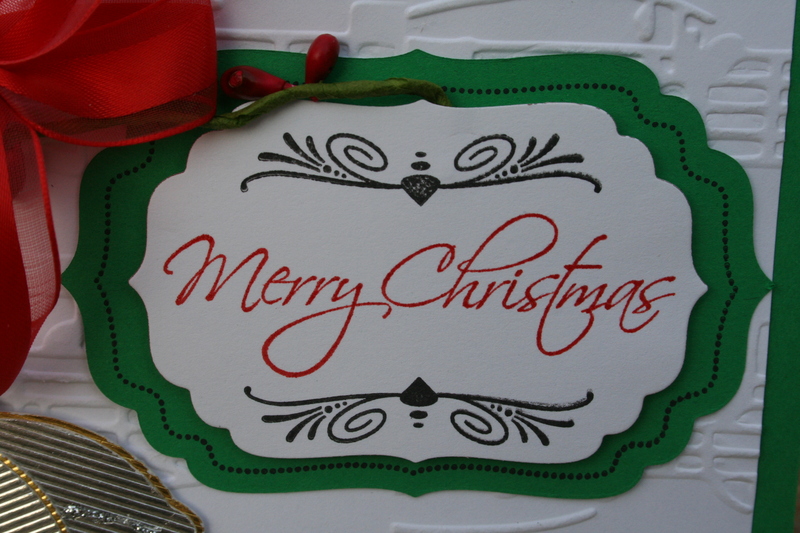 I cut a large circle in the card. 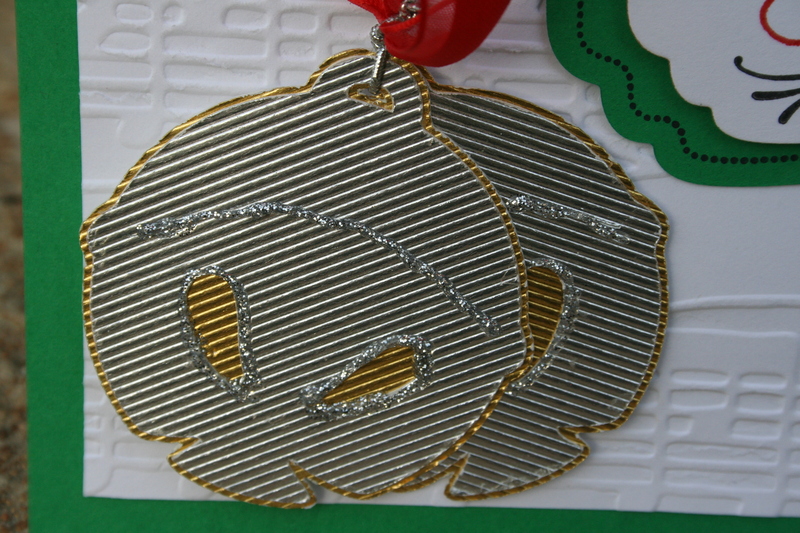 Then cut out a rectangle in the color I wanted as my globe (light grey) and cut out a slightly smaller circle. 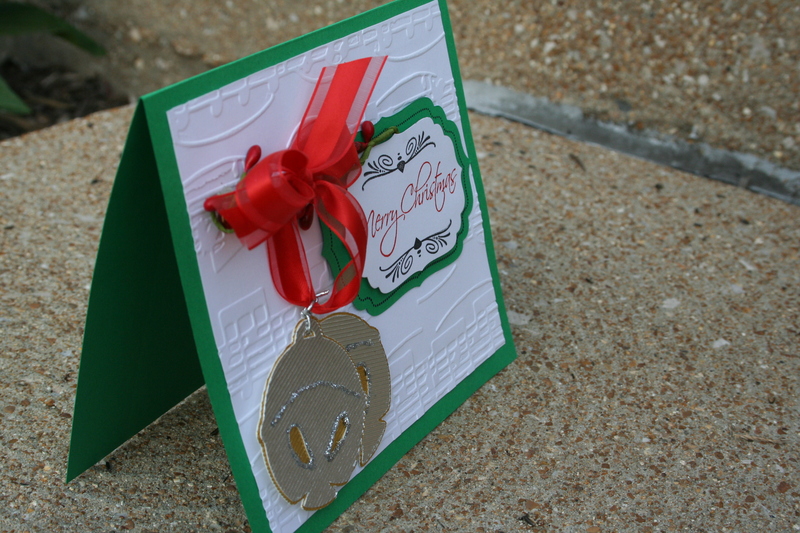 Then I placed the rectangle on the inside of the card, on the back of the front flap, so you could see some of the color come through around the edges. I cut out another large plain white circle. 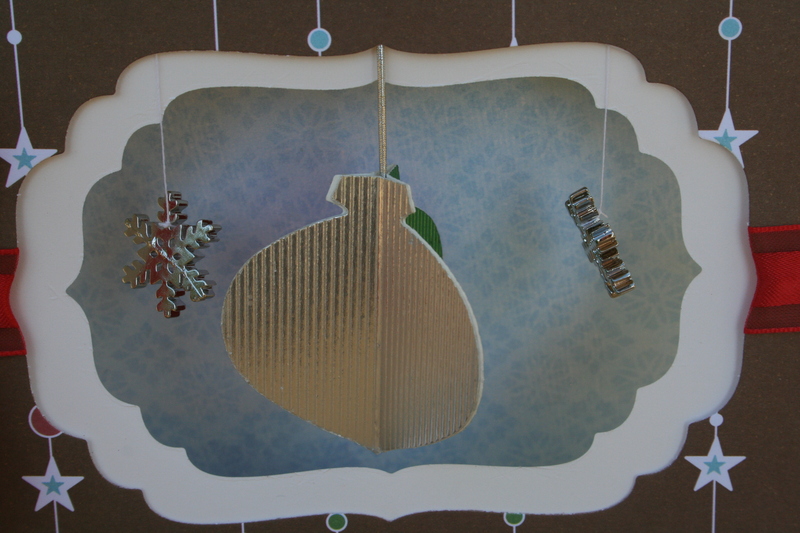 I placed this on the inside of the card to when it was closed the white circle fully covered the opening in the card. 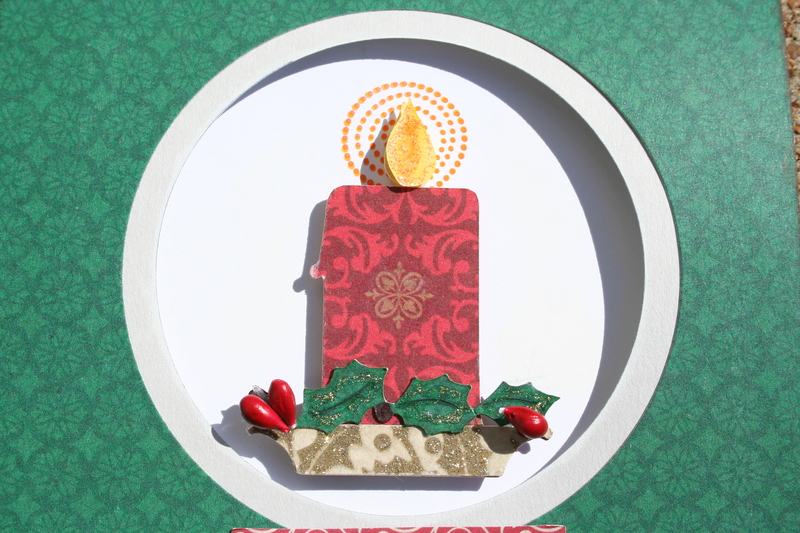 Next, I cut out the candle and all the pieces that went with it with my Gypsy. I assembled the candle on the white paper, stacking the flame three high after I had used my Copics to color it and crystal Stickles to give it some shimmer. 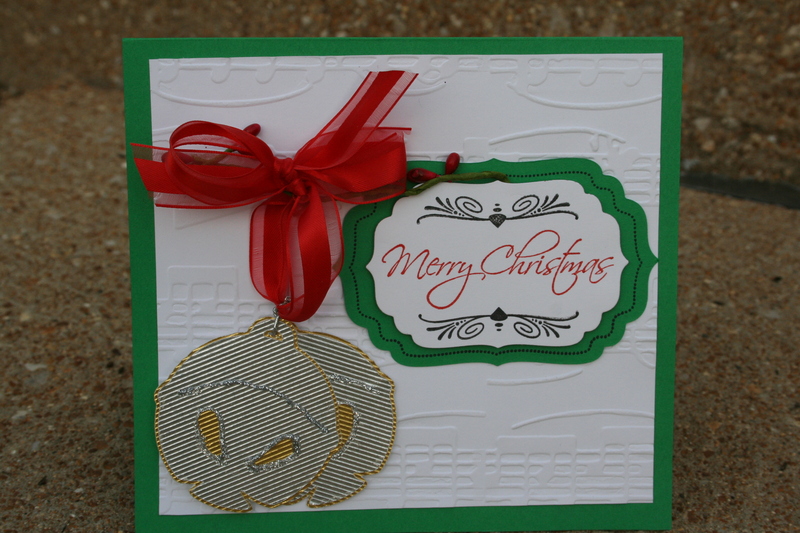 I also stamped the dotted circle (Stampin Up) under the flame twice, once in orange once in yellow, just before gluing everything down. 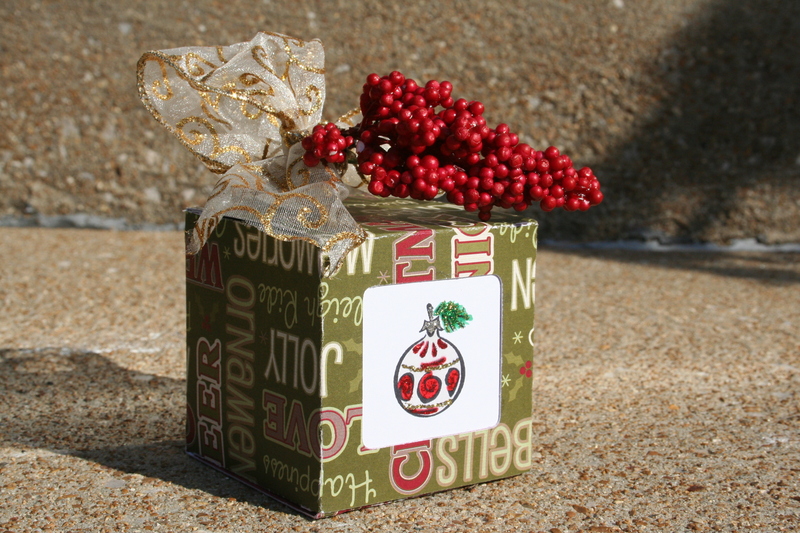 Then I colored and glittered the holly leaves, and added some berries I had from home decorations. 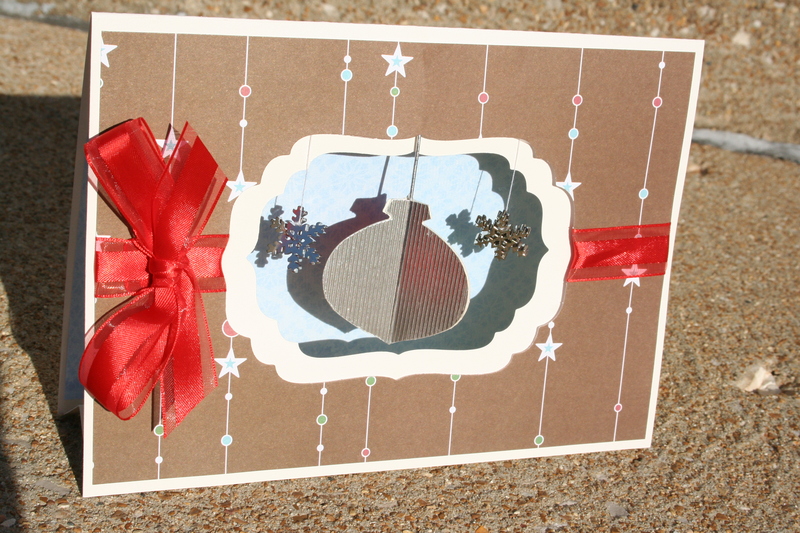 I added a ribbon, then adhered the snow globe base to the card. 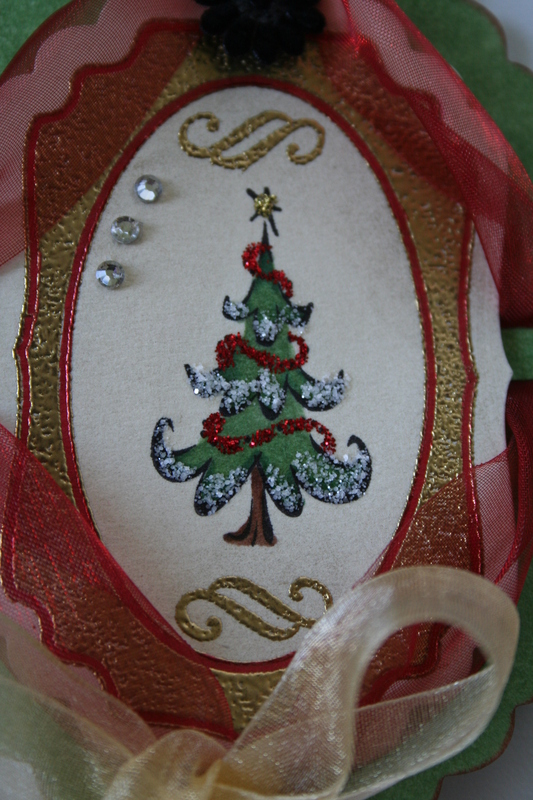 Finally, I cut out more holly and blinged it up before placing it on the base. 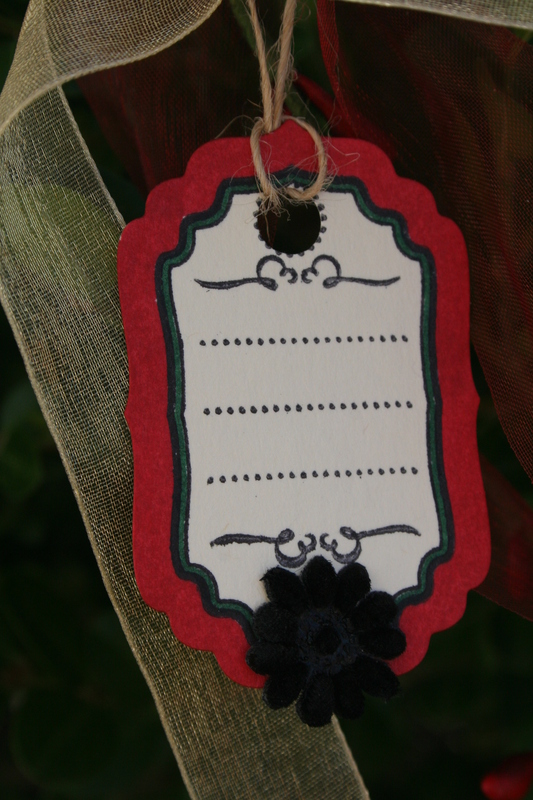 I rounded the edges of the card and inked them with red. 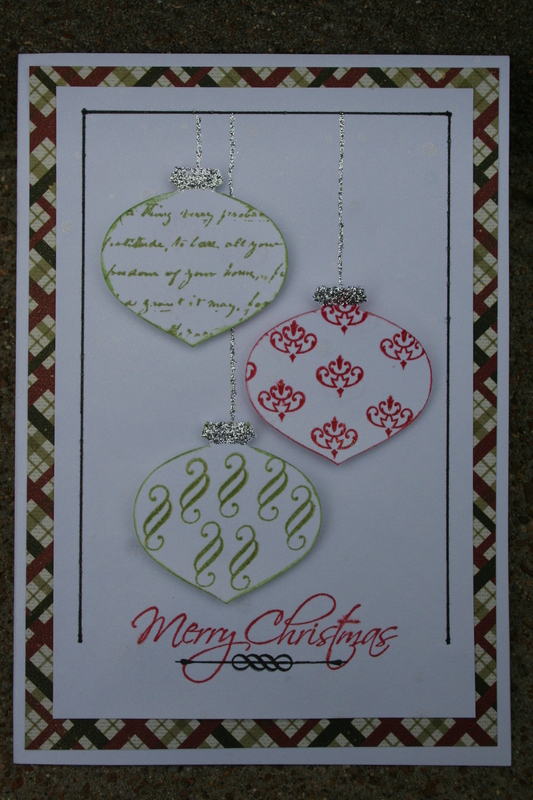 The patterned paper is from DCWV Christmas stack. 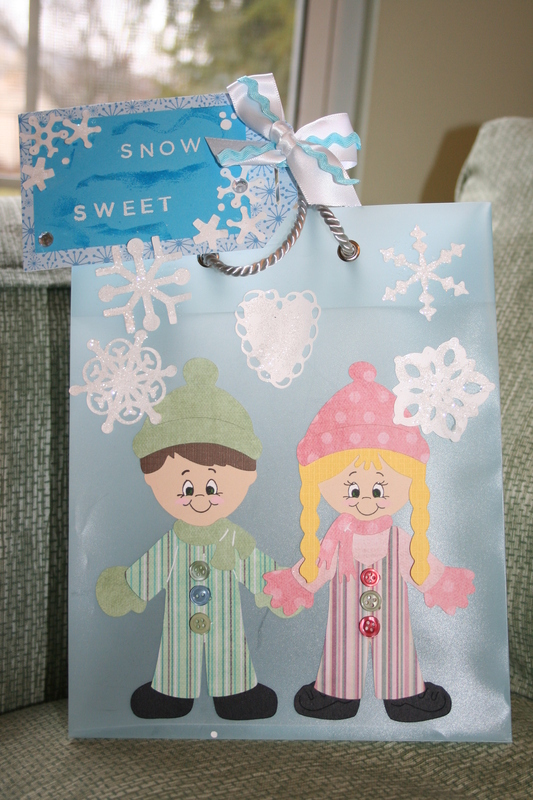 Part of the reason I finally decided to start this blog is that I wanted to share my creations with someone (my kids are happy to see them, but….and my husband just says “That’s nice”). 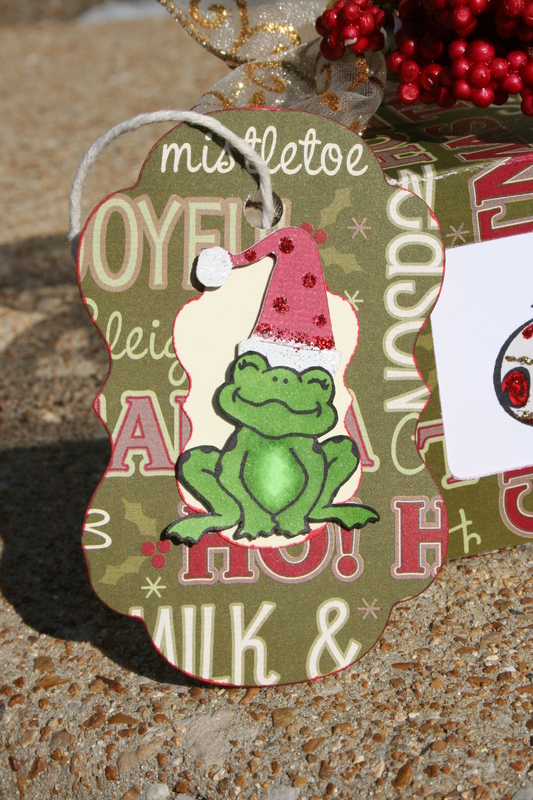 So I am hoping for some great feedback, ideas and education from the more experienced crafters and bloggers. Also, I am hoping to post tips, instructions and how to’s. 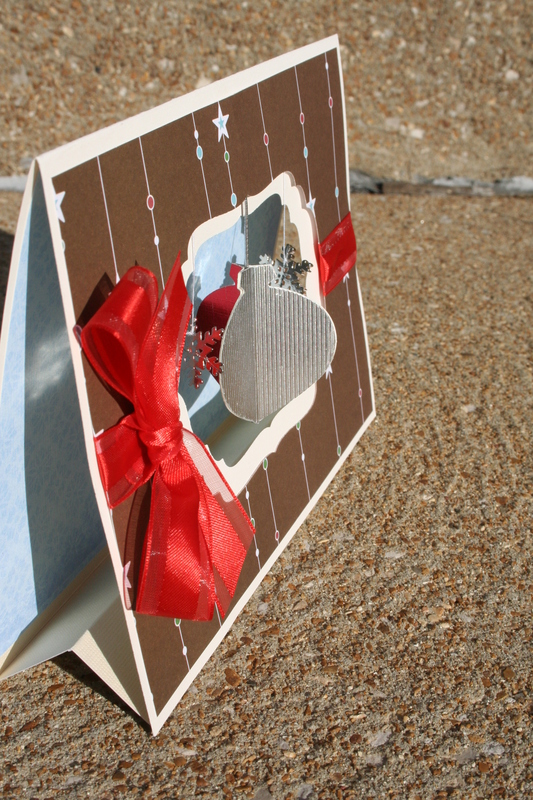 The biggest hurdle I have is learning all the different things you can do in the world of scrapbooking. I am hoping to make it easier on others. Finally, I wanted a place to link to for other blog challenges, and then you will know about them,too.